On Saturday 1st July the Centre for Scottish Culture hosted CILIP’s Library and Information History Group conference at the University of Dundee. On the theme of The Information Landscape in Scotland 1600-1900, it brought together librarians, academics and researchers for a varied programme of talks, with speakers and delegates from across the UK. In advance of the event, delegates were treated to a behind-the-scenes look at some of Dundee’s hidden treasures. 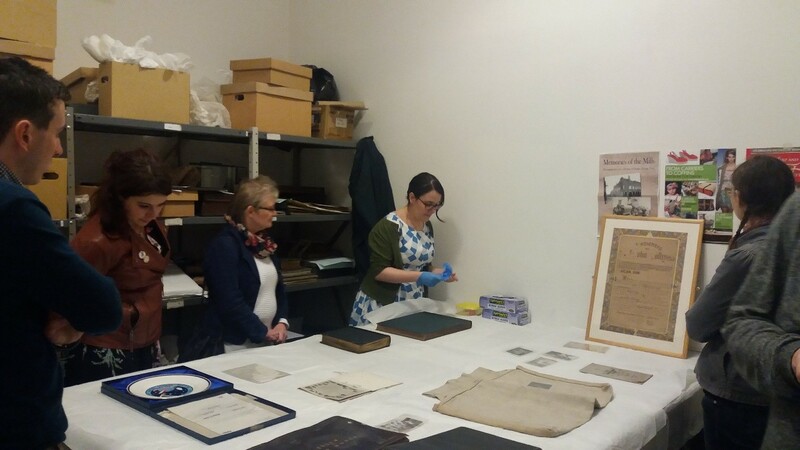 Louisa Attaheri, Curator for Dundee Heritage Trust, showed some of the gems from the RSS Discovery and Verdant Works collections, and Caroline Brown, University Archivist, led a tour of the University’s collections. Penguins, plates that had been to space, extensive photographic collections and a complete historic Episcopal church library – Dundee has a lot to offer! 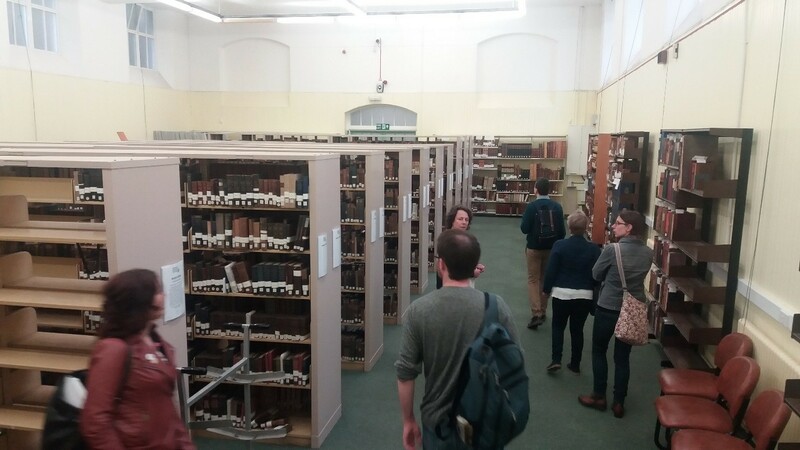 Delegates were then invited to join members of the public on “A walk with words: a tour of Dundee’s literary streets”, led by Erin Farley, PhD student at the University of Strathclyde based at Dundee Central Library. 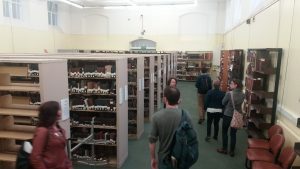 She guided the group through Dundee’s library and literary history, with some very animated readings of primary material including a vivid description of the “strange and motley crowd” of readers which gathered at the Albert Institute Library (now the McManus collections). The conference proper began the next morning with a keynote address entitled “Patriots and Rogues: Observations on Scottish Lairds and their Libraries, 1700-1900” given by Peter Reid (Robert Gordon University), new editor of CILIP LIHG’s journal, Library and Information History. This was followed by Kelsey Jackson Williams (University of Stirling) and Mhairi Rutherford presenting their joint paper “Rare books in Early Modern Scotland: an unknown quantity”. These two papers made an excellent start to the day, the first providing a thorough overview of the libraries formerly held in some of Scotland’s most remarkable buildings, with the second looking into what made individual ‘rare books’ in such collections desirable to their collector. In contrast, the three papers which followed concerned more publicly accessible and working-class libraries. John Crawford (Leadhills) discussed “New Evidence on Library Activity and Mutual Improvement”, while Lara Haggerty (Innerpeffray) made the case for the public use of Library of Innerpeffray in its earliest incarnation. Annette Ramsden (Edge Hill University) rounded off the morning with her paper “The Society of Friends Libraries of Aberdeen and Kinmuck”, representing yet another facet of the historic library and information landscape in Scotland. After a successful networking lunch, Erin Farley (Strathclyde), fresh from her walking tour the night before, explained how working-class poetry both disseminated news of and critiqued current events in her paper “The News in Verse in Nineteenth-Century Dundee”. Elizabeth Quarmby-Lawrence delighted delegates with her paper on “Edinburgh University Early Library Records Project”, detailing the work currently being undertaken to make these collections more accessible to researchers, and using them to make sense of how many of the items still in the University collections came to be there. The last of the full papers was given by Duncan Chappell (Glasgow School of Art), entitled “State of the Art: Glasgow Government’s School of Design and its Library, 1845-1900”. Full of arresting images and some moving anecdotes about the GSA fire, his paper expanded upon new research into the library’s earliest history, including its early design, networks of exchange, systems of classification and the role of the artist-librarian. The day ended by going right back to the earliest period covered in the conference with three lightning presentations from the University of St Andrews, fresh from the USTC conference which had ended just that morning. Graeme Kemp presented “Books at Auction in Scotland Before 1707: An Analysis of the Catalogue of Andrew Balfour”, followed by Shanti Graheli on “Of Books and Doctors: the Wedderburn Gift at St. Andrews. PhD student Drew Thomas gave the final paper, “The Reformation and the Digital Humanities: Overcoming Barriers of Accessibility for the Crawford Collection” on the steps that some researchers have to go through to make the records of one collection speak to another. It resulted in discussion between the researcher (him) and a delegate from the institution which housed the collection, which was a particularly poignant end to a conference which sought not only to elucidate on the chosen theme, but to facilitate interaction between curators and researchers. A full write-up of the conference with more detailed description of each paper will be available in CILIP LIHG’s Winter 2017 newsletter.